Content marketing doesn’t have to be complicated. Here are a few places to start. Welcome back to month eight of the Bold Brand Challenge. In our last article, we discussed how to make your brand a digital content hub. Next month we’ll get into the details of how to delegate topics, due dates, and authors, but today we’ll talk about the types of content you should start with, as well as how to plan and automate content that builds relationships with your prospects and drives sales opportunities. What’s the difference between content marketing and advertising? If you’re new to the world of content marketing, let’s clear up something quickly—content marketing isn’t the same as advertising or selling. Content marketing is all about tools you create to help teach, inform, or benefit your prospects without trying to sell them anything directly. Think of educational blogs, social media, white papers, videos, podcasts, emails, infographics, live presentations, webinars, and more. 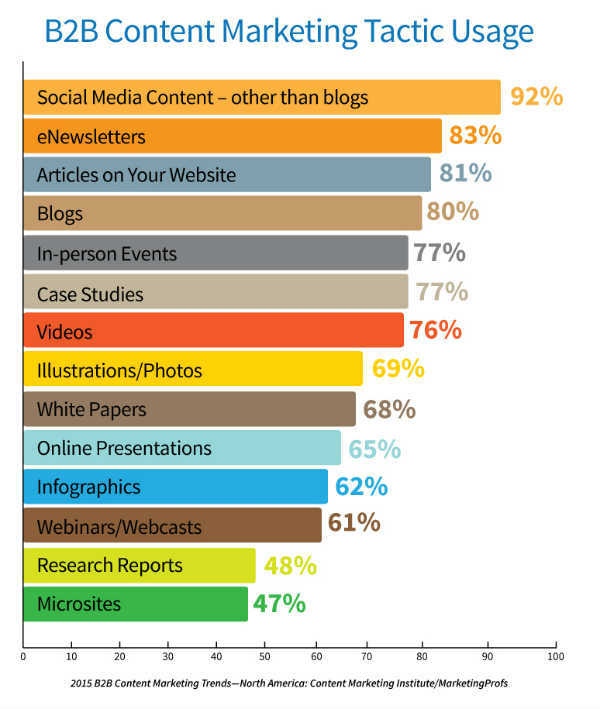 If you would like to see what the most popular types of content are, Content Marketing Institute (yes, there is one of those) dives into this research and has compiled its findings in the annual B2B content marketing research report. So yes… content is pretty much everything. What kinds of content should your company be creating? With such a long list of options (even if you just focus on the chart above), how can a business owner or marketer decide what to do first? Well, if you’ve read our post from last month, this shouldn’t be a surprise… I always recommend you begin with content that lives on the web properties your company owns. Your website and/or blog would be the best place to focus on first. Now, before we get too far, please remind your team (as well as yourself) that content marketing isn’t something you do once and it’s done. Creating fresh content on your website is something that should just be part of your business process. Regular updates for you could be monthly, weekly, or daily. A great target is to aim for one or two new pieces of content per week. Scale that goal to best fit your reality. As you begin to build content on your website and blog, here are three types of content I’d encourage you to begin with: focused blog posts, process or client success-focused case studies, and premium content. The key word here is focused. I’m not recommending that you create an online company journal, only people inside the company will read that. Your company blog should focus on questions that your prospects regularly ask, and provide valuable information that positions your company as a leading brand, or positions you as an expert in your field. Consider building out case studies that either showcase your process (of course this assumes you have one), or an example of how you helped a client achieve greater success. Once you start building out content on your own website, the other key place that I’d encourage you to focus, is your email list. Many marketers have been down this path in the past 10 years, and many have already given up on it. What you may or may not realize, when email is done right, it can be a very powerful content marketing tool, as well as using a email hosting service on your website, as it will allow you to access it from anywhere and any device. Now, as a public service announcement, please don’t send monthly emails, with a subject line of “monthly newsletter.” I can’t think of anything I’d look forward to less than a monthly newsletter. Your subject line is the most important part of that email. Be sure to make it interesting, and relevant to the message contained within. Aim to keep your emails interesting and helpful. If nothing else, you could use your email marketing to share your most popular pieces of content on your website. Email is a great way to promote your helpful pieces, case studies, and premium content. But remember, email is also a really great way to correspond with your list. Email marketing messages that read with a conversational tone are great ways to communicate and engage with your audience, and help keep your company top of mind. And although email isn’t necessarily an asset that will show up in a web search, it is an asset you own. And an engaged email subscriber list is undoubtedly an asset. Now put the two together and add some automation! 1. Create a drip campaign for new email subscribers. Our company sends a full welcome sequence of emails (check out that link for a great example), where we ask our subscribers what they’d like to learn, and how we can help. (Remember: Content isn’t about selling!) If the subscriber doesn’t open any in the sequence, we take them back off of the list. We want to be sure they stay engaged. 2. Automatically email new blog posts. Many subscription services exist to send every new post via email to your list. Although many companies follow this practice, we prefer to curate specific posts for our emails. 3. Premium content or a sequence of lessons. Allow prospects to sign up for your premium content, but require them to fill out a form before they can have it. Similarly, you could develop a multi-email training sequence. Reuse your top educational blog posts or develop a fresh sequence of lessons to share via email. Ultimately, this is just the beginning. As we already mentioned, there are SO MANY options for content marketing, but if you get a great base of content on your website and a strong email program in play, you’re well on your way to a solid content marketing program. Make a list of types of content that you want to create in the next 6 months. Determine what types of content you’re going to add to your website. Will you focus on blogs, case studies, or premium content first? Destroy that boring monthly newsletter approach, and bring a little surprise and delight to your subscribers’ inboxes. Speaking of which, you can sign up for my list here. I share branding and marketing tips to a thousand marketers and business owners, every other week. Remember, you can do this! If you’ve missed any of our previous challenges, check them out here. See you next month, when we’ll discuss building a content calendar to assign topics, roles, and scheduling. And remember to share your questions, challenges, and successes on your favorite social networks below—better yet, blog about this post on an owned medium! Josh Miles is a caffeine and Twitter addict, and the principal and founder of Miles Design. He was honored as one of Indianapolis Business Journal's 2013 40 Under 40. Josh is also the author of Bold Brand: The New Rules for Differentiating, Branding, and Marketing Your Professional Services Firm. His expertise is highly sought after by professional services firms from coast to coast.